You may already know we are launching a ‘Picnic’ recipe book as a part of our birthday celebrations. We are looking for our PAMIS families to get involved and send us their recipes to include in the book which will be printed and be sold at future events. We would love to know your favourite picnic recipes, for example, soups, savouries and baking. 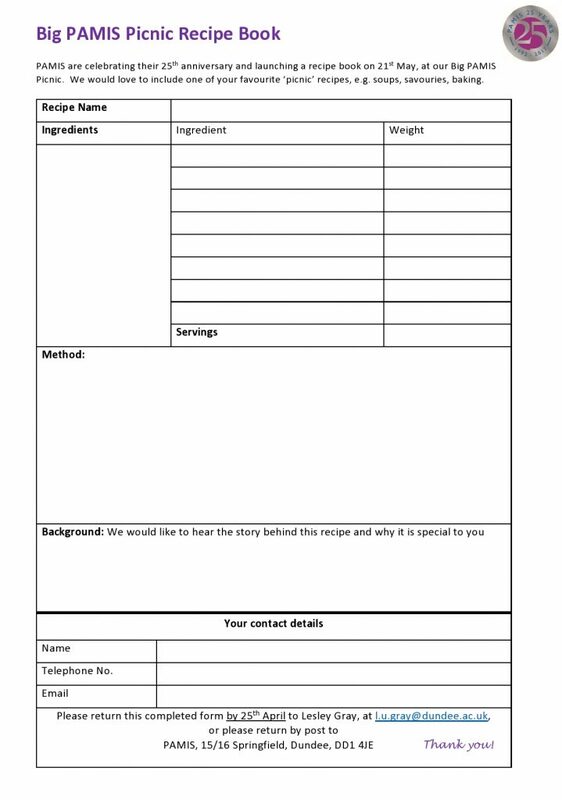 If you would like to share your recipe please complete this recipe template and send it to Lesley Gray at L.U.Gray@dundee.ac.uk or bring it into your local PAMIS office. Please share with family and friends and gather up as many picnic recipes as you can. Please email Lesley or call us on 01382 385154 if you have any questions.